There is a lot of contradictory information out there regarding the benefits and detriments of juicing. You can see some "rules" about which juices to avoid, or possibly dangerous combinations of juicing ingredients. Let's take a look at some of these and see if they hold up. It is OK to mix different types of ingredients in juices. A new trend among some people these days is called Mono Eating. Advocates of this state that our bodies are designed to only consume one ingredient at a time. This is a myth. To say that you can't combine fruit with meat, or fruit with grains, or especially fruits with vegtables is just not true. The fact is that our digestive system is designed to handle a wide variety of food. Whether or not they are eaten separately or together doesn't matter. There is no truth that combining fruits with vegetables causes food to accumulate and decay in the intestines, disrupt pH levels, or destroy vital enzymes that are necessary for digestion. Fruits and vegetables must be consumed separately. Fruits and vegetables containing polysaccharides (banana, carrot, beet) may not be combined with acidic fruit (citrus, pineapple, cherries, sour apples). Leafy greens shouldn't be combined with sweet fruits. It's most likely a normal reaction of your body to something new, or simply too much was consumed. Everyone is different and might react differently to the same thing. It's a similar situation with mushrooms, where 1 person out of 100 might have a reaction to a certain type of mushroom. There is the possibility that you have a preexisting health problem if the combination gave you stomach pains or a large quantity of gas. It can also be a problem if you are just starting with juicing and you drink too much, or are drinking a large amount of something you typically don't drink. It's always best to start slowly and let your body adjust. Don't start by drinking a liter of juice! Start with a glass of juice a day, diluted with some water at first. Be careful when drinking juices with strong cleansing properties. Juices from ingredients like beets, dark leafy greens, dandelions, or medicinal herbs should be consumed in small quantities. Always listen to your body. If the problem persists, see your doctor. Be careful with 100% fruit juce! Since it's true that fruits generally contain a lot of sugar, does that mean we should limit their consumption? In the case of eating whole fruit, it's not a problem since at the same time you are consuming the insoluble fiber which slows the absorption rate of the sugar. 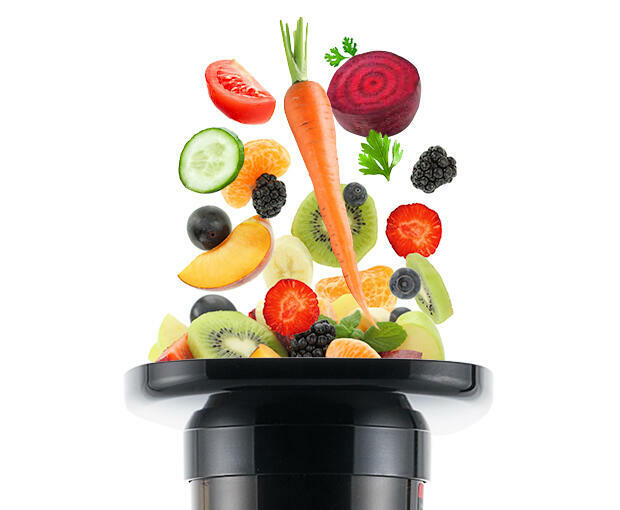 The benefit of juicing is the high absorption rate of vitamins - up to 4 times more vitamins are taken in by the body through juice versus eating whole fruit. The downside of juicing pure fruit juice is that there is no fiber to slow the absorption rate of sugars into the bloodstream. So with pure fruit juice, we need to be careful, especially adults. For example, it wouldn't be a good idea to drink a large quantity of 100% grape juice. It would cause a rapid spike in blood sugar levels, followed by a corresponding crash and would put a lot of stress on the pancreas. A great solution is to mix fruit juice with vegetable juice. Ideally, the ratio should be at minimum 50% vegetable juice, but more is better. This keeps the glycemic index lower, reducing or eliminating any spike in blood sugar levels. The goal should be to drink mainly vegetable juice, using a little bit of fruit for flavor or sweetening. Things like carrots or spinach make a great base for juices, and you can add ingredients from there. Another solution is to consume healthy fats along with fruit juice. For example, a handful of healthhy nuts or seeds will help slow the sugar absorption rate without reducing the vitamin absorption. You don't need to completely eliminate pure fruit juice. There is nothing wrong with a small glass of orange juice at breakfast, especially if you are drinking it alongside some healthy foods.